Captain Britain meets Dr Who. Is Russell T Davies a secret Captain Britain fan? | The Captain Britain fans' page and blog. Captain Britain meets Dr Who. Is Russell T Davies a secret Captain Britain fan? Now updated – see last paragraph and comments. Next to my love for Captain Britain I also have an unhealthy obsession with the classic BBC sci-fi series Dr Who. 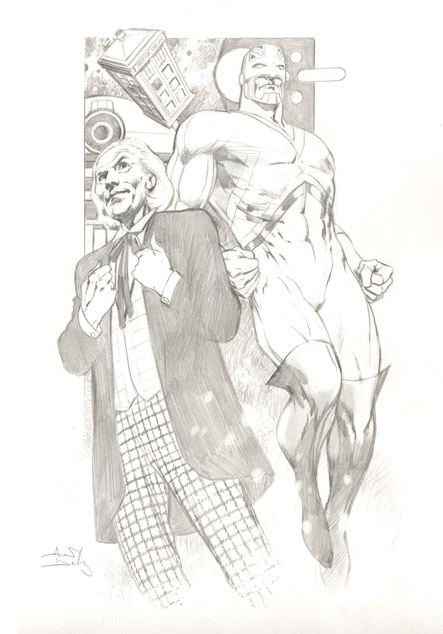 So imagine my delight when I found on the tumblr of Brian Michael Bendis the Alan Davis’ sketch below, which combines my two favourite characters. The good Doctor (shown here in his first regeneration when William Hartnell played him,) really does look quite unimpressed that he’s joining forces with a superhero to battle the Daleks and Cap’s nemesis The Fury. In fact as I view the sketch I can almost imagine Hartnell harumphing and tutting in his fantastic irascible style, while Cap tries not to aggravate him and remain deferential. As I viewed the sketch the whole idea of Captain Britain and Dr Who began to swirl round in my head, I was sure there was another connection between the two programs, but what was it? 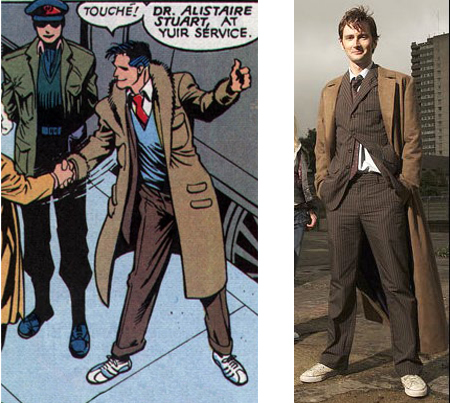 I’m fairly certain Alistaire made his comic book debut in 1989 a long time before Tennant took over the role of the good Doctor, and that no mention of the Excalibur character was ever quoted as an influence on Tennant’s costume by the BBC or Russell T Davies. Could all this speculation be just a coincidence, I think not! Do you think a Dr Who and Captain Britain cross over would be any good ? Do you think the look of Tennant’s Time Lord costume is just a coincidence or is Russell T Davies a closet Captain Britain fan ? UPDATED – cheers to Ads who in the comments below points out another Dr Who and Captain Britain link, this time via the supporting character of Merlyn. This entry was posted in Captain Britian's most British moments, Crossovers and tagged Captain Britain meets Dr Who, Excalibur meets Dr Who, modern masters alan davis, Russell T Davies and Dr Who by Richard. Bookmark the permalink. That passed me by, thanks for tip I shall look it up. Found the reference on Wikipedia which is taken direct from the Die by the Sword trade and references Merlyn’s link to Dr Who via this bio…. If I remember rightly Sylvester McCoy’s Doctor is referenced as Merlin in the episode Battlefield. Seems we’ve come full circle with our Dr Who and Captain Britain links. Pingback: Captain Britain, The Sweeney and the Seventies. | The Captain Britain Blog.